The Office Ninja BLOWGUN combines the thrill of shooting with the stealth of a ninja into an addictive blowgun game for everyone. Practice your Ninja skills at home or at work without any risk of damaging walls or furniture. A short, sharp, and forceful exhalation acts as an explosion of power to propel the specially designed projectile at maximum velocity through the barrel of the blowgun. The lightweight projectiles travel very precisely and penetrate the Styrofoam target with a "thwack". 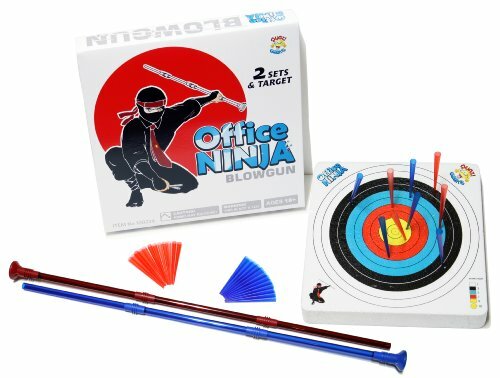 A fun and exciting game, Office Ninja includes two blowgun sets and a Styrofoam target and hours of competitive fun for you and your friends. Each blowgun set includes one blowgun and 12 projectiles. Blowguns are made of translucent acrylic and come in deep dark blue and deep dark red colors. Each set has fully matching color. Each blowgun is about 30" in an assembled state. When not in use they can be disassembled and stored in a box that measures less than 12" x 12" x 2" making the game set incredibly portable. Lightweight, soft projectiles are reusable. The recommended shooting distance is about 11 ft. Protective goggles must be worn at all times while playing (goggles not included). The Office Ninja Blowgun Kit comes with 2 blowguns and 24 soft ammo darts and a Styrofoam Target. Each Blowgun measures 30 inches when fully assembled and is made of translucent acrylic and can be easily disassembled for portability. The lightweight projectiles are made from a soft plastic and travel very precisely. These projectiles keep the game safe while guarding against the risk of damage to walls or furniture. The Office Ninja Blowgun Kit is recommended to be played from a shooting distance of 11 feet. If you have any questions about this product by Unitech Toys, contact us by completing and submitting the form below. If you are looking for a specif part number, please include it with your message.